I really enjoy this guy’s site. I realize that by directing people away from this site, I’m not doing the whole ‘monetizing your site’ gig correctly. But since ‘people’ really is barely more than one person, I’ll forgive myself. This goes to a specific subpage, ‘annoyances’. once you start reading you can’t stop, though maybe you need a masochistic streak. Reading about other people’s stupidity amuses me. So what prompted the story about 1979? Well, i was about to write an humorous little story about an incident from back in my misspent youth. That story is actually an outgrowth of the events of 1979 detailed previous. while my mother was in the hospital, in intensive care, given those ominous odds of ’50/50′ chance of living, i sat with her weeping. this was about a year after i had graduated from high school, and i was quite directionless. i’d had no plans to go to college, even though mom always wanted me (all three of her sons for that matter) to go to college. sitting there, i decided that the right thing to do was to promise her i would indeed go to college. to do that for her. so i did. i hurriedly applied to san jose state university, and started classes barely a couple of months after her accident. of course, i pretty well frittered away my college years. i was still directionless. i had no real conception of the responsibilities that lay ahead as an adult (and since my emotional development had come to a screeching halt at age eleven, perhaps that makes sense). i took history of art, graphic art, fine art, electronics, metalworking, philosophy. pretty much whatever interested me at the moment. never declared a major. dropped out in my third year. but….i digress. that humorous little story, yes, i remember now. 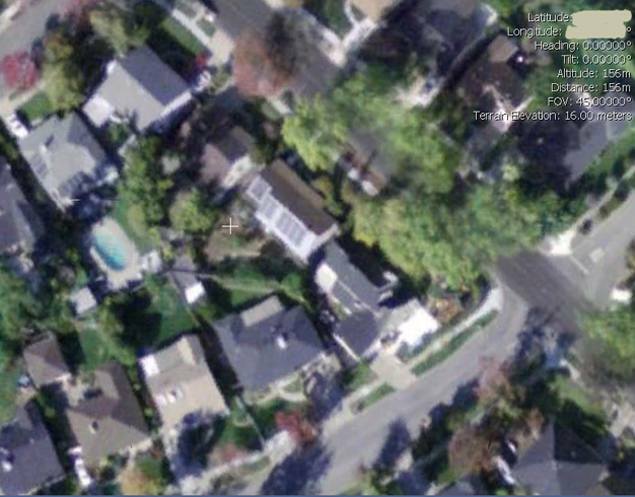 In the home I grew up in, in Redwood City, California (Aerial Photo), the garage was of the fairly standard ‘unfinished’ style—bare studs in the walls, no sheetrock covering them. My parents had made a makeshift attic in the rafter space, by laying boards out between the rafters, and it actually created a very serviceable space. In order to reach the attic, you climbed a jerry-built ladder, consisting of small boards nailed at intervals up one set of studs. Worked fine for the most part. sometimes as you were climbing it, you could feel one of the steps ‘giving’ a bit, as the nails pulled ever so slightly as you put your weight on them. Never more than say a quarter of an inch—at most. no problem, you’d give it a little kick in and you’re back in biz. As we learned unfortunately, everything has its breaking point. In 1979, my mom was climbing the ladder, and the board she’d just grabbed for came loose as she put her weight on it. She fell to the concrete garage floor, cracking her skull sharply. She nearly died from the trauma. She developed a bruise on her brain, and was initially given straight 50/50 odds of living (which is doctor–speak for "we have no idea whether she’ll live"). After about a week in intensive care, she came out of her coma, but couldn’t talk. Asking her a question, she’d make some unintelligible noises. But her eyes were alert, and she was clearly frustrated. So we gave her a pad of paper. You couldn’t really make much out from the scrawl. After several days, I tried writing a simple sentence on a card and asking her to copy it. That was a little better—you could make out the words for the most part—but they were jumbled. The syntax was all wrong. It was very peculiar. You could see that she understood what was being asked, no question about it. But formulating the concepts as words to utter was apparently badly disrupted. Eventually, she came home from the hospital. Gradually over time, she began to speak—very very simple things initially. Very hesitant—you might ask her something, and it would take ten or fifteen seconds for her to form/think through uttering the words. As more time passed—months, years—she slowly regained the ability to speak, but it really took many years before there was no more noticeable hesitation in her speech—I’d say easily ten years. As we learned much later, what had happened was that the bruise on her brain had destroyed the ‘speech center’ of her brain. Completely killed off. And what took place over those years was her brain ‘teaching’ other parts of the brain to take over those functions again. Pretty remarkable what the brain is capable of. As should be painfully clear by this juncture, I have no voice. Which is to say, if you took a map of the United States, and each throw of the dart were a post here, you’d have landed in a kibbutz in Israel, a yurt in Mongolia, and a walk-up flat in Liverpool. Oh my I am so darned clever aren’t I! So, I’m struggling. I’ve tried a handful of different directions – which isn’t to say that I consciously said ‘hey let’s try this’, but rather I’ve gone where the mood strikes me (which perhaps suggests some mood modifiers may be in order). This is hardly a blog. Observational humor? Er, I suppose. Quirky, odd posts? Er, I suppose. Earnest attempts at earnest observations of earnest political issues, earnestly committed? Er, I guess. Completely pointless bon mots, tossed out seemingly in desparation? Uh, yeah. I don’t have the self-discipline to have a ‘theme’ for my blog, other than this ever so pretty WordPress theme with the pale colors. I’ve never been terribly self-disciplined. In fact, I have almost no self-discipline at all. Other than when it comes to taking care of customers – that’s where I funnel all of my disciplined energy. I’ve been a Unix admin for….well, I’m in my thirteenth year doing it. Before that, I was a Unix user for the previous eight years (what’s the distinction? maybe I’ll explain it in the next thrilling chapter here). So all told, I’ve been enveloped in the world of Unix for twenty-one years – nearly half my life (I’m 46). Running servers means watching servers. Watching servers means serving the server. I have a dozen system ‘tests’ that are performed on my systems every two minutes. If anything fails a test, I get a page. And boy do I get pages. Most are throwaways – notifications that somethings a little out of bounds, but not causing a problem for customers. But there I am, being notified, at all hours of the day and night. Which means effectively as long as I have customers, I’m a slave to the servers I run. This past February, I got on an airplane for the first time in twelve years. The last time was to go to my grandmother’s funeral in Washington DC.. Twelve years without ever being much more than a hundred miles from my servers – so that if there were a problem, I could rush down there and fix it. It was an amazing leap of faith to take that week in Arizona, for that matter. Hey, look. here we are well into yet another blog entry, and….what the heck is the point of this post? What am I trying to say? There’s one blessing: nobody’s reading. Well, one poor sap seems to be reading occasionally. I feel sorry for him. Or he feels sorry for me. Something like that. Hi Peter!